Rufus 2.0 is now available doe download. Rufus is a free software to format and create bootable USB flash drives. What’s new in this release? support for Windows To Go (when Rufus is running on Windows 8 or later). support for Grub4DOS and GRUB 2 based images (e.g. FreeNAS). portable application support, through a ‘rufus.ini’ file. 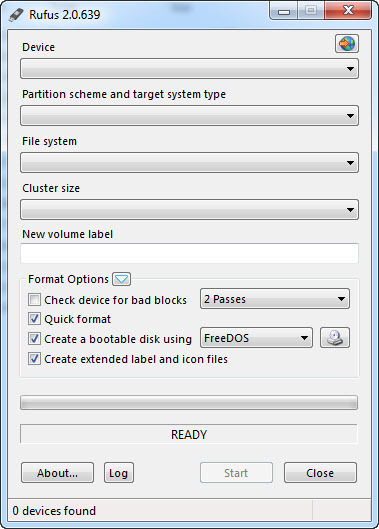 seamless UEFI boot of NTFS partitions, for Windows ISOs with large files (>4GB). support for Windows multipart ‘install.swm’. support for non Microsoft VHD drivers. Norwegian translation, courtesy of JED. Fix a crash on image selection when no device is present. Fix broken VHD support on non-English version of Windows. Fix write error for DD images that are not a multiple of the sector size. Update embedded Syslinux to 6.03. Update Windows version listing for Windows 10.